A comic for boys, girls, and everyone in between. Click here to start reading!! New page on Mondays, Wednesdays and Fridays (at no real consistent time, but usually early). 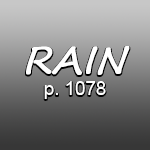 And don't forget, Rain - Volumes 1 through 4 are now available for order. Click here if you're interested in more information. And you can also support the author on Patreon! Today's page will be up a little later on. In the meantime, I want to give a little heads up about it. I don't know if it requires a trigger warning, per se, but it is a little rough and it's kinda designed to be frustrating/stressful. Still, I worked hard on it, and I hope you'll look forward to it all the same. My name is Jocelyn Samara DiDomenick. I'm a gamer, anime fan, trans girl, and author/artist of the webcomic, Rain. Hey Jocelyn, you're an amazing artist, and Rain's story is very moving. I have a friend who's female to male trans, so you help me understand him better, although when I'm talking about him to other people, I do occasionally use the wrong pronouns. He was my bro since before he started transitioning, so when I talk to him that's what I call him. Anyway, I'm rambling. Just wanted to say keep up the good work! In an age of intolerance, we need more people like you. And I wanted to make a suggestion. Have you ever considered pitching RAIN as a show? I recently watched an older show called My Life Me that has your same kind of style. It would be interesting to see what you could do with it. Hi, stupid question. probably but if someone provided proof of purchase of your books could they get the bonus chapters as image files in color? or just the image files in general?